A new-look Daydream Island has burst back onto the Whitsundays scene, and it’s looking dreamier than ever. Since the 1930s, there has been an island so perfectly situated at just 30 minutes from the mainland, so wonderfully balanced between beaches and rainforest, that it’s little wonder it earned the moniker ‘Daydream’. 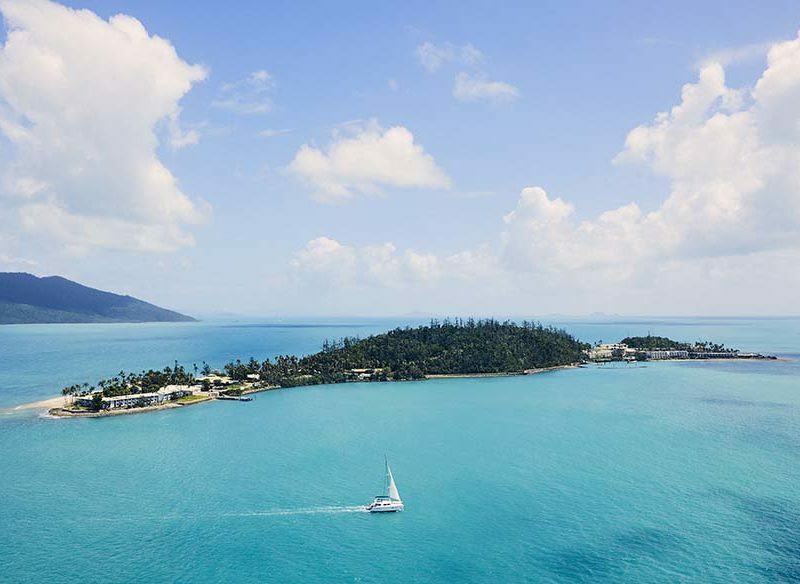 Its mermaid statues beckoning the waves, famously teeming reefs for snorkelling, and scenic rainforest walks have made it somewhat of an icon in the Whitsundays over the years, but now an unprecedented, thorough makeover of the entire island has brought the island front and centre as the region’s most talked-about reopening. The premium resort, nestled among the island’s rather gorgeous natural attributes, sports architecture that fully reflects the island’s beauty; its design and even new direction in dining do the same. Three brand new signature restaurants and the same number of fresh new bars each have a distinct feel, with an overarching credo to showcase the best seasonal, locally sourced produce throughout their offerings. Regional specialty produce is combined with Australian native flavours at the more casual Inkstone Kitchen and Bar; for premium dining, Infinity is set to serve lunch and dinner accompanied by its incredible vista across the islands. Diners can choose from an Asian fusion menu, and there is even a private teppanyaki suite for maximum event dining. The third eatery, Graze Interactive Dining, is promising a great outdoors-in experience with draping plant life and floor-to-ceiling windows. Inside, an interactive foodie marketplace of live cooking stations and hugely varied cuisines and specialties levels up the simpler resort dining experiences, and it overlooks Daydream Island’s pride and joy, the Living Reef. Always an integral part of the ‘old’ Daydream, the freeform coral lagoon of the Living Reef is bigger and better than before, wrapping 200 metres around the resort’s main building and offering an unbeatable and rather lovely chance to really feel a part of the Great Barrier Reef. A resident team of marine biologists uphold the island’s strong and committed ecological and educational focus, offering guests the chance to join them to feed baby stingrays, and view more than 100 species of fish, coral and underwater fauna from four metres below the surface in a new underwater observatory. Even the island’s Kids’ Club offers its smaller guests the opportunity to interact with and learn about the creatures within the Living Reef. Also set among the tropical gardens is a winding, lagoon-like swimming pool landscape, punctuated by the Barefoot Bar that serves anything from gourmet sliders to fresh smoothies and almost compulsory tropical cocktails. Add to that its famed coral beaches, outdoor cinema and adults-only sanctuary, and unlimited non-motorised on-water activities. For those who want to take their explorations further, activities such as heli-tours, snorkelling safaris and sailboat or jetski hire are on the cards.